The local bourse retreated on Wednesday on the back of losses recorded in retailers and index giant, Naspers. The weakness recorded in retailers was triggered by the release of Shoprite’s [JSE:SHP] trading statement for the half-year ended 31 December 2018. As preempted by its recent sales update, the trading statement indicated that Shoprite is expecting a significant drop in revenue and profit for that period. The stock slumped 14.28% to eventually close the day at R153.13. 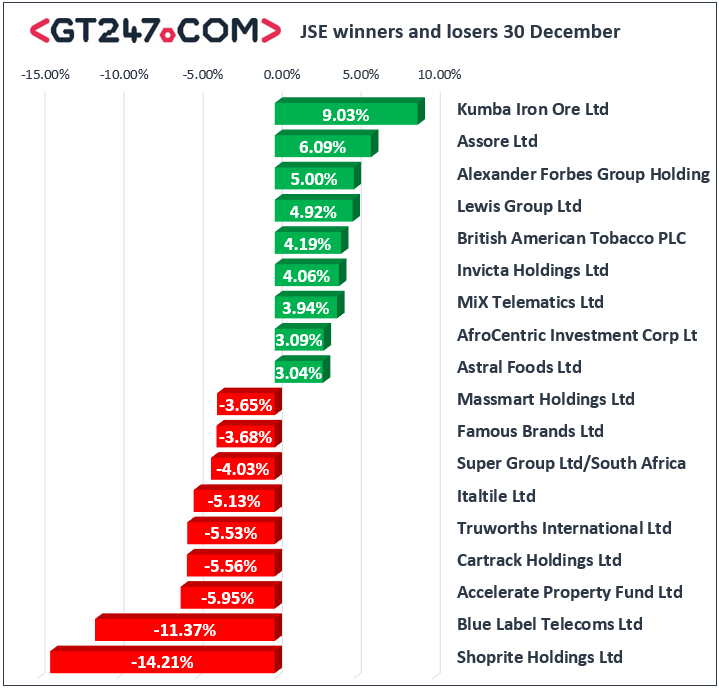 This sentiment spread to retailers such as Truworths [JSE:TRU] which lost 5.53% to close at R77.26, and Massmart [JSE:MSM] which dropped 3.65% to close at R91.54. Volatility remains the constant for Blue Label Telecoms [JSE:BLU] which slumped 11.37% to close at R4.13 in today’s session. AVI limited [JSE:AVI] also came under significant pressure as it retreated 3.55% to close at R91.54. Index heavyweight, Naspers [JSE:NPN] closed at R3023.56 after losing 1.98%. Miners were the day’s biggest gainers on the JSE with Kumba Iron Ore [JSE:KIO] closing amongst the day’s biggest advancers as it climbed 9.03% to close at R332.00. Anglo American Platium [JSE:AMS] added 2.47% to close at R623.00, while Lonmin [JSE:LON] gained 1.32% to end the day at R9.19. Gold miners were also buoyant as AngloGold Ashanti [JSE:ANG] advanced 2.06% to close at R188.78, while Harmony Gold [JSE:HAR] closed at R26.79 after adding 1.32%. British American Tobacco [JSE:BTI] recorded another session of gains as it climbed 4.19% to end the day at R468.25. The JSE All-Share index eventually closed 0.53% weaker while the JSE Top-40 index weakened by 0.52%. The Resources index was the only major index to record gains as it closed 1.21% firmer. The Industrials and the Financials indices closed 1.36% and 0.46% weaker respectively. The rand traded mixed in today’s session as it swung between gains and losses against the greenback. At 17.00 CAT, it was trading 0.16% weaker at R13.62/$. Brent crude advanced yet again in today’s session after it gave back most of its gains in overnight trading. The commodity was trading 1.03% firmer at $61.95/barrel just after the JSE close. At 17.00 CAT, Gold was flat to trade at $1311.09/Oz, Platinum was up 0.12% at $815.15/Oz, and Palladium had managed to gain 0.3% to trade at $1347.29/Oz. Bitcoin was 1.16% firmer at $3523.20/coin, and Ethereum had managed to add 2.8% to trade at $110.31/coin.